I have been reading some older posts about this but I wanted to ask for current opinions. We have two environments and I do some customization and our partner does some development. I currently create my own solutions in sandbox and we move them from sandbox to production. We are discussing the use of managed solutions. What do you think? Is more information needed to make a recommendation? thank you for your help! As a customer for me, its unmanaged, have been doing it that way for the last 8 years. For ISV and partners who build solutions as their product, Managed works. I just find unmanaged there less risk to get yourself into trouble. One of my key reasons is that we often refresh our Sandbox environments from production using minimal copies, so using an unmanaged solution reduces the risk of putting a managed solution into your sandbox thus blocking future customization. There are pro's and cons for each, but, I haven't seen a convincing reason yet for me to move away from unmanaged. I think it will come down to the ALM practices and process you follow at your organization. I recommend listening to @Gus Gonzalez's CRM MVP Podcast on Managed vs Unmanaged. He's joined by @Seth Bacon, @Neil Benson, @Nick Doelman and @Aiden Kaskela to discuss pros and cons with managed and unmanaged solutions. @Jonas Rapp has also given his take on the topic (here and here) and there's probably lot's of other blog posts out there on the topic. We're using managed as well for the same reasons as @Todd Mercer. I too recommend listening to the podcast, it presents a lot of points to consider. However, I don't think anyone will deny that Microsoft's position is that we should use managed solutions. I expect we will see gradual steps from Microsoft that will prod (no pun intended) us all in that direction. At the moment, I use unmanaged solutions to move changes from dev to production. But one thing unmanaged solutions can't do is remove components. For example, you have a custom field in production that an unmanaged solution added and later you decide you no longer need the custom field. To removethe field you would have to manually remove the custom field from production. Whereas with managed solutions the field can be removed via solution updates and not manually removing the field. A small point but possibly important one for purists who advocate never editing anything directly in a production system. We started out with Managed but switched to Unmanaged. Managed solutions for internal development require a level of discipline which we were unable to achieve. Also - we never even came close to having to use their main feature - being able to pull back solution imports. Unless you have a very complex environment, with lots of different users, needs, and system customizers, I would say stick with unmanaged for internal development every time. We have used Managed in production and Unmanaged within Sandbox Environments and in some client sites they have made use of Unmanaged in all environments. Where Managed solutions have been used, there is more control in place and does enforce a discipline and governance. Generally speaking Partners tend to use unmanaged within sandbox instances if they are engaged with you on site and then move managed to production and in some cases other instances from dev. This is to ensure there is no tinkering of the solution in diff environments relating in different versions from the original source, where the solution was first created etc. I would personally start with unmanaged within DEV and then have a separate source control repository to track the different versions of the solutions and use managed solution within production and other instances leading up to production. However it does all come down not so much to the technical elements, but the process of managing the solutions/ size of the teams/ collaboration between teams and governance/ repository to manage your versions. The only place you should have unmanaged solutions is in a Development environment. End of. If you have unmanaged in anywhere else you need to take stock, think and ask yourself why. Unmanaged solutions in even in test environments is analogous to a bad code smell, and you should think if the reasons you need for doing this could've been overcome with a different design. This is Microsoft's definite direction and we should all be aligning. You should be testing exactly how it is/will be in production, and this means managed solutions, otherwise you're just introducing another variable, which in turn is just another risk. The better question to ask is, is the solution for internal purposes or external customers? If it's the first then go for unmanaged. If later go for managed. Your code should be checked in to a code vault anyway, so the managed solution container doesn't really matter. What is really the benefit of locking yourself into a corner with a managed solution? It's a different story when the solution goes to a customer's system. How about the octagon? LOLZ! On a more serious note, why would a "locking mechanism (or lack there of)" be a sign of a code smell? Shouldn't that be handled with tests and code reviews? There is nothing in a managed solution that would prevent bad code. And on the DevOps side, managed solutions just makes it more difficult to automatically promote solutions across environments. Maybe the use of the term 'code smell' was a bad one on my part. I meant it was analogous to a code smell, rather than it's specifically being one. Managed vs Unmanaged, as you say, says nothing about what is inside the solutions, which is where the bad code would be. What I meant is that when if you're running unmanaged in test, and managed in production, that means that what you're testing isn't the same as what you're pushing into production, which feels like a bad 'smell', if you get what I mean. There is a phrase in the aerospace industry, which is 'test it like you'll fly it'. It applies here too. Thanks everyone! We are not a partner, so we use our code internally only. After I posted this question, I did listen to Gus Gonzalez's podcast last night! It seemed pretty universal that all five MVP's agreed that unmanaged was the way to go (in my situation). I was trying to keep an open mind and do some research because our partner is suggesting that we move to managed solutions. I wanted to fairly evaluate both sides before forming my opinion. I have used unmanaged for the past eight years so of course I was leaning that way, but wanted to do the research. Thanks so much for all of your input - I truly appreciate it! After doing a little more research on the topic and meetings with Microsoft, the key point that has come back multiple times is having an ALM strategy and using source control to help. In theory, all of the configurations of the system live outside of the system itself and are stored in Azure DevOps (formally TFS) or another source control system. This would allow you to create a dev instance with unmanaged solutions whenever it is required. That said, I haven't come across very many companies that have a strong ALM strategy and are leveraging source control. Here is a quick breakdown it if helps. Not looking to add fuel to either side of this fire but add value and potentially change what the focus of the discussion is about. As was mentioned, Microsoft is working towards having all configurations use a managed solution container in production. I would encourage everyone to evaluate their ALM strategy and work little by little to grow the maturity of their process. No lynching here. Everyone is entitled to their opinion. I will just say that my opinion is based on a couple hundred implementations and dozens of incidents where managed solutions caused massive issues that could've been avoided by using Unmanaged solutions. Not once in my career I've said "Man, I wish I had used Managed Solutions"...that has never happened. On the other side, I can't count the many times I've said "Man, I wish they had used Unmanaged Solutions" or "Man, I'm glad I used Unmanaged Solutions"...too many to count. And yes, you could say that under the perfect conditions and with the perfect ALM strategy these issues should never happen when using Managed Solutions but if you are counting on perfection when it comes to Dynamics 365 Implementations and how most companies maintain their solutions then you are going to be humbled. This, by the way, is nothing against the customers using these solutions - but the idea behind using 'CRM Online' is that you can be up and running quickly without having to make the massive investment Fortune 50 companies could make to get up and running On-Premise. So the idea that you have to have an expert team of specialists to make sure your ALM strategy is perfect just so you can use Managed Solutions is incompatible with the idea of using CRM Online for 99%+ of businesses out there. If you listen to our episode you can hear 5 Dynamics 365/CRM experts, with hundreds and hundreds of implementations and decades of expertise, struggling to come up with any benefits to using Managed Solutions, and you not only come up and disagree with this assessment (which is fine, not everyone has to agree with the vast majority of MVPs and experts out there) but you "can't believe we are still debating this in 2019"? Hi @Gus Gonzalez, my statement was meant to be a little more 'tounge-in-cheek' than maybe it has been taken, so apologies if I didn't come across that way (that's the subtext that's lacking on the internet) but I stand by my original statement. I'm not going to get into the debate for (as you pointed out) it's been done to death a thousand times, and everyone has a view. I still thin​k that all other things being equal, the advice to anyone who is implementing a new system should be to promote anything outside of dev as managed. I have a fair bit of experience myself in doing both ways, but have just finished a project where this 'unmanaged in dev only' mantra was followed and it turned out absolutely fine. The fact that Microsoft (whilst not mandating) are guiding us heavily towards this only underlines my view. You are right...it can turn out absolutely fine when you do everything perfect...but that's the problem here, there are tons of time when things don't go perfect, and when they go bad using Managed Solutions, they go REALLY bad. So, best case scenario you make no mistakes and nothing happens (no real benefits above Unmanaged), worst case scenario and you go through hell. 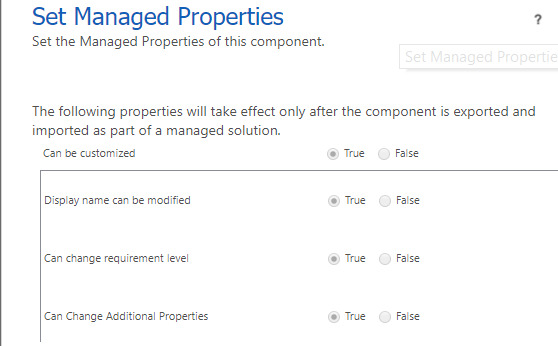 Also, Microsoft has been guiding us heavily towards managed solutions since CRM 2011, this is not new. I personally think that if you are a partner/implementer (but not an ISV), using Managed Solutions on Dynamics 365 Implementations represents a disservice to your customer. It represents more work, more risk, and zero real world benefits. Is there a reference or source that I can refer to, to avoid the pitfalls and have that "smooth managed solution" experience? I am still with team unmanaged but would like to see how managed can be done correctly when it comes to patches, upgrades and etc. Also found this blog and I agree with the author. The best advice is to be informed and be prepared to accept the consequences of your choice. Like with anything there isn't a magic bullet, and the main issue to overcome is not one that is unique to managed, things like degrees of parallel development, team and functionality decomposition (specifically how much decomposition you can realistically do with a SaaS product). But Microsoft have given us tools such as Patching and Merging to try and get around some of the pain points, and these tools continue to improve, even if not as fast as we would like. There was a session at UG Summit in Amsterdam run by Per Mikkelsen, in which this was discussed at great length, with the same party line from Microsoft. I think some of their ALM expectations are optimistic bordering on unreasonable, but apparently investment is in place to help smooth out the process. Microsoft have released an updated whitepaper ​on D365 ALM. The title is a bit of a mouth full. and Common Data Service (CDS) for Apps. Its interesting reading peoples responses and some of the arguments for and against. I dont agree with all of the arguments used against Managed solutions because you can make adjustments to artifacts within Managed Solutions so long as when creating the artifact you elected to set the Managed Properties of it to be customized. To make a change you open the default solution, access the artefact, and make the change. I am on Team Unmanaged. We only produce solutions for internal use. If you create Managed solutions and your development environment is refreshed from Prod, you could end up in a bad situation.